Over the years Mental Ray’s integration within Maya has been kind of hit and miss. 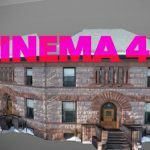 Some Mental Ray features needed to be specifically exposed in Maya, and it seemed like there was no real parallel with 3ds Max’s available of features. On integration, Mental Ray seemed like an afterthought in Maya. You needed to borrow and hijack a lot of Maya elements and tack on mental ray features to them. Lights, being an example of that. 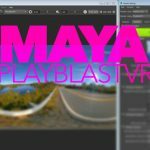 Since the release for Maya 2016, there has been a new path forged with not only Mental Ray’s features and capabilities, but also its integration and use within Maya. Plenty of things have been streamlined in Maya’s MR integration. A new ideology has come into play for Maya 2016. This is separating the Mental Ray install from the Maya application install. This might seem like a simple thing, but it is a huge help to have the mental ray on its own installer. By separating the installs, you can easily update mental ray independently of Maya. The new version of mental ray offers up a new global illumination model and engine. Dubbed “GI Next”, the engine sets out to compute indirect lighting more efficiently. The new GI engine does all the indirect lighting that you would see in Final Gather, such as color bleeding, and diffuse bounces. GI Next supports motion blur and is currently working with custom shading effects, like lens distortion and depth-of-field, volume effects, and subsurface scattering. It does all this with a new brute force based algorithm. GI Next’s goal is to work both on the CPU and the GPU, however, the current version is considered largely a prototype. GI Next is under continuous development. The Material Definition Language isNVIDIA’s plan to have a standard physical material format. Pre-packaged MDL materials can be applied in mental ray for Maya 2016. MDL materials take advantage of the new rendering techniques in mental ray, as does the prior addition of the MILA materials. The newer rendering techniques rely on the core of mental ray to optimize the scene (Light IS, MDL, GI Next, MIS, etc.) and use GPU when it is possible, to get better rendering speeds. 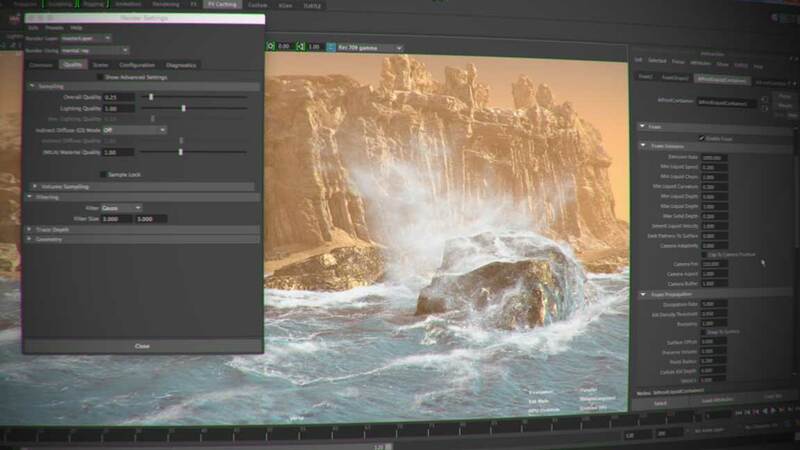 Yes, finally Maya 2016 brings metal ray lights to the forefront under the Create>Lights menu. You are now able to create a Physical Area Light, Physical Sun, Environment Sky, and Environment Image IBL from the Lights menu. A notable addition is the new Object Light. Selected objects will instantly be turned into an object light in your scene. This is a huge improvement from before, where the process to have an object emit light was tedious to say the least. Area lights in mental ray for Maya 2016 now use a new MILA light shader and can be easily textured and sampled at render time. You can now output deep data EXR files. Mental ray will render out and save the image in the DeepTile of the EXR 2 file format. You can even save deep data into different frame buffers during the same render. Mental Ray for Maya 2016 gets rid of a lot of the immediate controls found in the render settings. The tabs have been simplified and slimmed down. The render settings for MR now sort 5 tabs that are sorted by topic. Advanced users can draw out more advanced settings with the detailed controls that will fine tune rendering. The sampling section has seen some changes. It now separates the previous unified sampling slider into more finer controls. Unified sampling is now designated as “Overall Quality”. There is a new Lighting Quality setting affects the Light Importance Sampling used for the lights in the scene. A new Env. Lighting Quality slider does the same for IBL lighting in the scene. 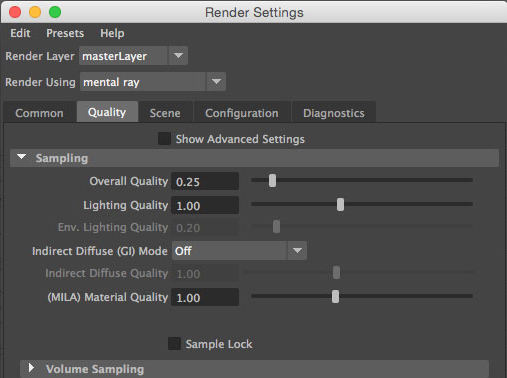 To learn more about the inner workings of mental ray for Maya 2016 and what it has to offer, visit the Elemental Ray blog, where David Hackett covers the finer points in detail: Maya 2016, new features and integration. NVIDIA’s Inside Mental Ray blog also has a look at some of the new features in mental Ray for Maya 2016 that you should definitely check out.